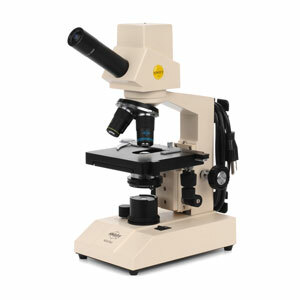 This microscope is an outstanding investment for your classroom or anywhere an LED Compound Microscope may be needed. Unparalleled student-proof features eliminate the possibility of tampering or damage. Added convenience of cord-hangers allow for safe & hassle-free cord storage. Energy efficient LED illumination system features an increased bulb life and decreased heat transmission. With a built-in 1.3MP digital camera, this monocular digital microscope comes standard with 4X, 10X and sealed 40XR objectives, (sealed 100XR(Oil) objective is optional), 18mm eyepieces, separate coarse and fine focusing, built-in mechanical stage, substage 1.25 Abbe condenser, and variable LED illumination. Capture digital images through your microscope and export them to your computer or laptop using Motic Images Plus software. Calibration slides included. Windows XP, Vista, 7, and Mac OSX compatible.